We’ve all had the feeling of being alone in the world. 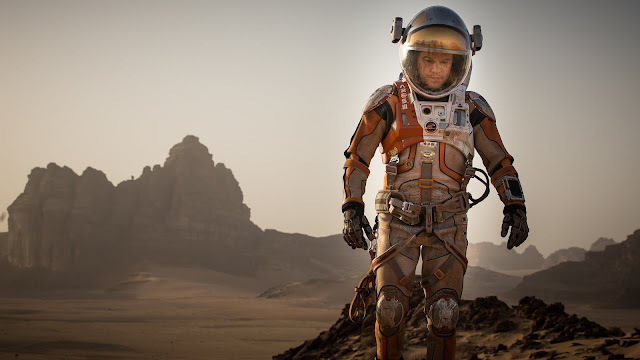 Only Mark Watney (Cast by Matt Damon) knows the feeling of being alone on Mars. Thank you Grabies sponsor and I have the chance to watch this movie in 3D. 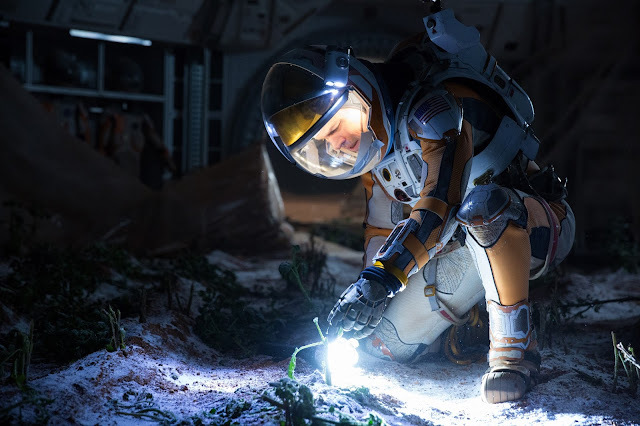 Mark Watney is left behind on the red planet when his NASA mission is cut short by a fierce storm, his crew presumed he was dead but he has survived and finds himself stranded and alone on the hostile planet. With no way home, he have figure out how to survive and find a way to signal to Earth that he is alive. He tries to grow food, make water and knock down the complications that inevitably arise. 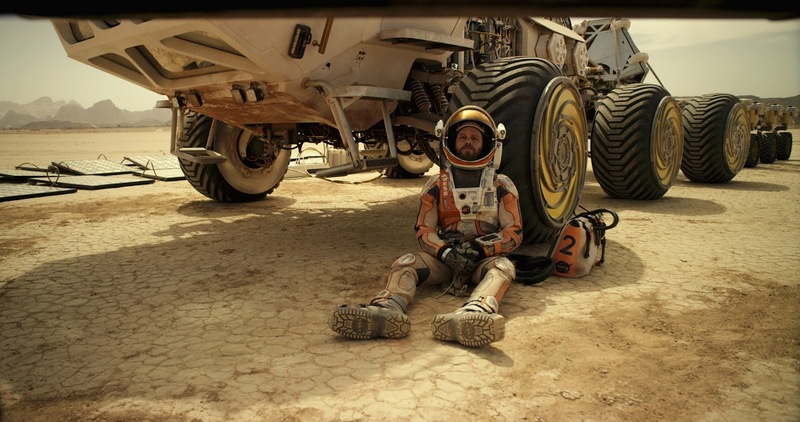 This carried in large part by the video diaries as he makes with the GoPro cameras hanging around the Mars. This is the ultimate survival story. 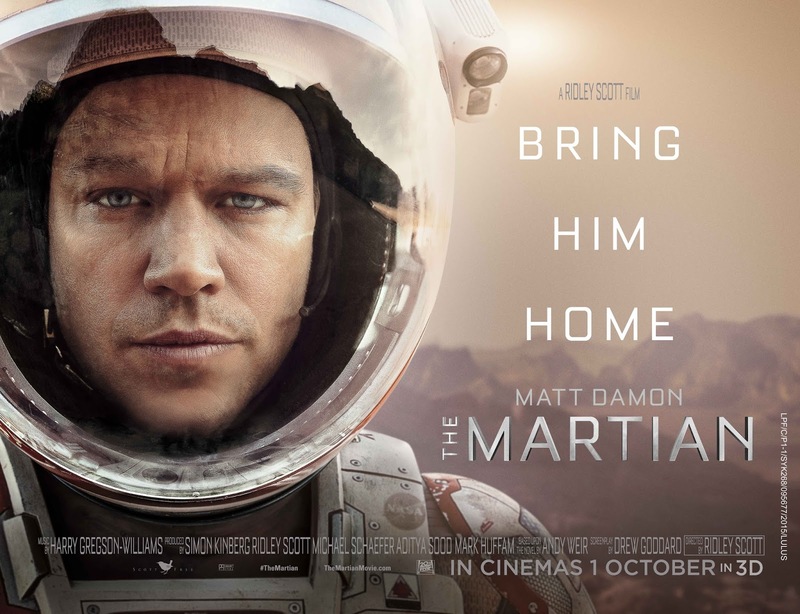 Mark Watney is placed under unimaginable duress and isolation, and the movie is about how he responds. Mark's fate will be determind by whether he succumbs to panic and despair and accepts death as inevitable - or chooses to rely on his training, resourcefulness and sense of humor to stay calm and solve problems. 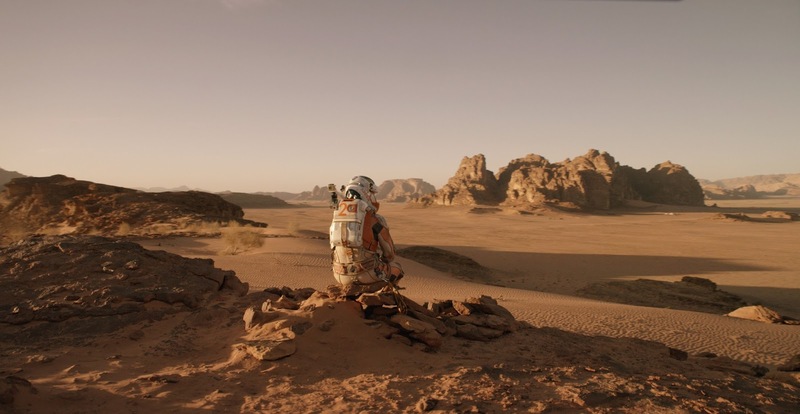 THE MARTIAN features a star studded cast that includes Jessica Chastain, Kristen Wiig, Jeff Daniels, Michael Pena, Kate Mara, Sean Bean, Sebastian Stan, Aksel Hennie, Donald Glover, Mackenzie Davis and Chiewetel Ejiofor. Buy your ticket now at any GSC and enjoy this movie! 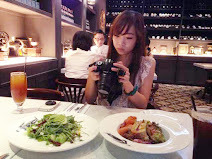 I'm sure everyone is know about Grabies if you have follow my blog. But if you are don't know what is Grabies, don't worry, I will explain here to you. 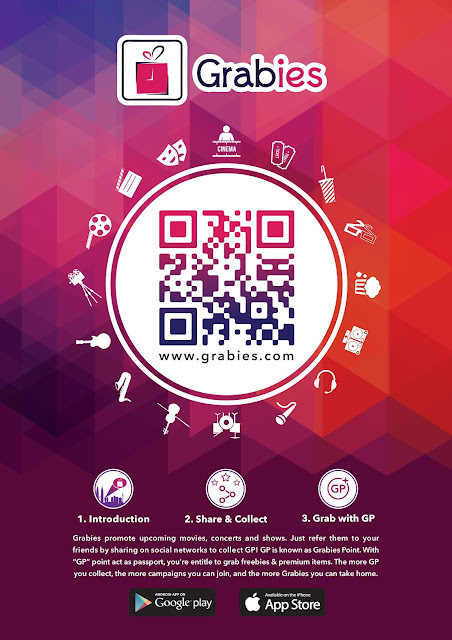 Grabies is a platform to giving out freebies and entertainment by collecting Grab Point. 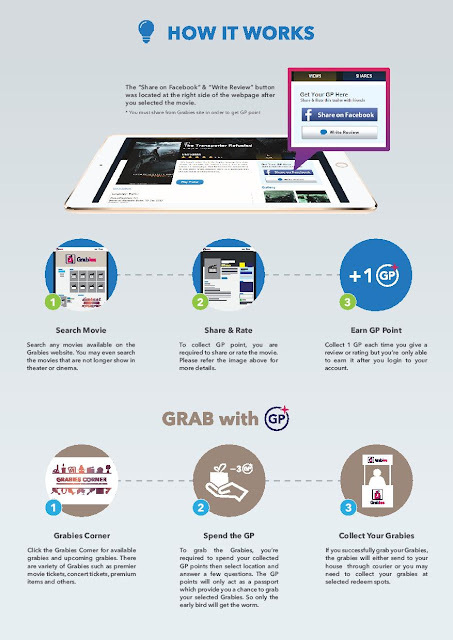 Simply share the movie you have watched on social media like Facebook, you will have your Garb Points. Click HERE and signup to enjoy more exclusive ticket and your favorite premium ticket from Grabies! Heard lots of good reviews bout this movie. I wanna watch too! Have heard a lot of good reviews from friends. Waiting for some free time in my schedule to catch it myself! I don't really like to watch the Martians. Quite boring for me. 2.5 hours is quite a long time to watch. But of course its worth to watch if its a good movie. Haven't watch this movie. Some say its nice some say its boring. I shall bring my boy with me to watch this! not my type of movie but gather it'll win tons of nomination. Wanna watch this movie but can't find any companion. Story line is pretty good. I'm sure not many people can be strong during tough time. Especially you are the only one in the planet! I also Grabies user too! :D I still enjoy to watch the movies when I won it on many times. Now, Grabies help the people can get tickets when they collect the points only, so easy! good app. Haven't watched this movie yet though. I think my son will enjoy watching this movie as he really loves the topic. heard a mixture of good and bad comments about this movie from my friends and colleagues....hmmm...unsure whether I will watch it or not...ha..ha.. 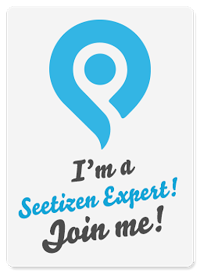 Interesting app! And yes the movie has many positive reviews! Thanks for the Grabbies sharing, and also the movie review. I'm gonna find a movie kaki soon lol! I wanna watch this! Reminds me of Interstellar, which I loved. Interesting apps. Maybe I'll install it and see what goodies I can milk out of it. i actually really wanna watch this show, i love this type of science fiction haha. geek in me. I heard this movie is really good! I want to watch it too. I got invited as well but sadly I was late that night.